As a follow up to my Pinkie Leads The Way post, here's a more complete snapshot of my current understanding on how important the inside ski is for performance skiing. Most coaching systems are not focusing much instruction towards the inside ski... the good racers all do what's needed, but mostly not because they have focused on it, but because of Darwinian-like selection and all sorts of other cues and directions "keep shins parallel", "tips even", "weight the outside ski" etc. Notably, the PMTS teaching system is an exception. as your skiing improves, you realize that it is mostly about balancing on the outside ski while managing the inside leg/foot/ski (and other body parts not under load). Today almost everybody agrees that weight should be mostly on the outside ski, thus the inside ski must be light. You can exaggerate and even lift it off the snow. If you instead put weight on the inside ski, the outside ski will not hold as well and the body cannot get inside the turn as easily. In fact, if you look at photos of racers over the past few decades, you will notice an exaggerated lifting of the inside ski at the beginning of turns - as ski design made skiing easier, this movement has become less and less visible, but it is present in all modern day high-performance skiing. 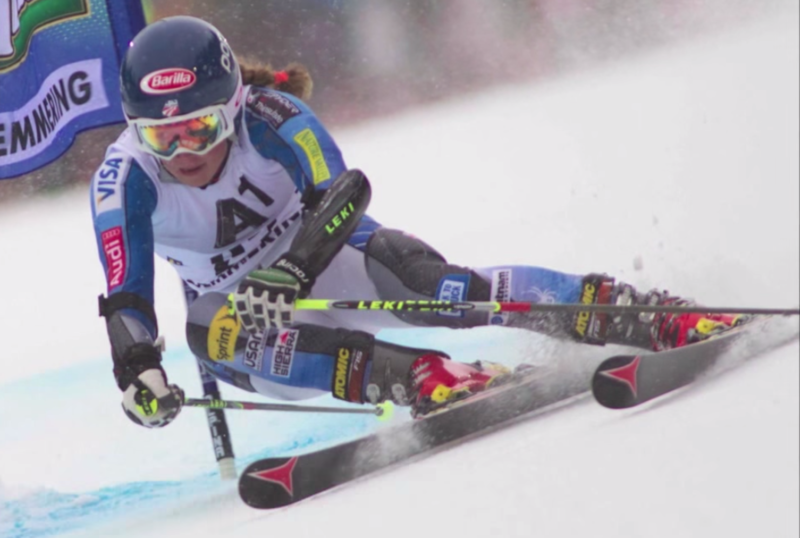 Can you spot it here in the modern still of Mikaela Shiffrin tearing up a WC GS course? Timing of the weight change is another variable: if you remove the weight while it is still the old outside ski you get an early release and the result is a faster transition, throwing you into the new turn faster, while also getting the balance on the new outside ski early. Tipping the inside boot is a related movement, because by tipping you are also lifting the inside edge off the snow or lightening it. I do not think "lift" the inside ski, but rather "flex it" to get it light. There is a slight difference that I feel is useful, see flexing below. allows tipping from the ankle and avoids "hip dumping"
The cue for pulling back is trying to keep the ski tips even, but truly you are just holding it back so it doesn't shuffle too much in front of the outside ski. As the angles build on steep pitches, the bio-mechanics at play will move it forward anyways, to keep the ankles at the same angle, towards the end of the turn. In terms of cues, you have "tips even" at the beginning of the turn and touching the inside boot with the outside knee at the end of the turn. Biomechanically, this is a very important movement. It's opposite is shuffling the inside ski/boot ahead to begin the turn and that will simply close the knee, not allowing an effective tipping anymore. It is extremely easy for you to test this: just shuffle your left leg half a boot ahead and try to tip the knee to the left. Now pull it back and try again - much easier, eh? This is a somewhat controversial approach to tipping the skis on edge. As my earlier Pinkie Leads The Way post noted, a focus on tipping the inside ski has more benefits than focusing on the outside ski and it is a recurring theme in good instruction. I haven't figured out the bio-mechanics here fully, but tipping the inside ski also drives/enhances the tipping of the outside ski. Some call this effect "phantom tipping". There is a very obvious connection between pulling the inside ski back and tipping it, which you can easily feel for yourself. 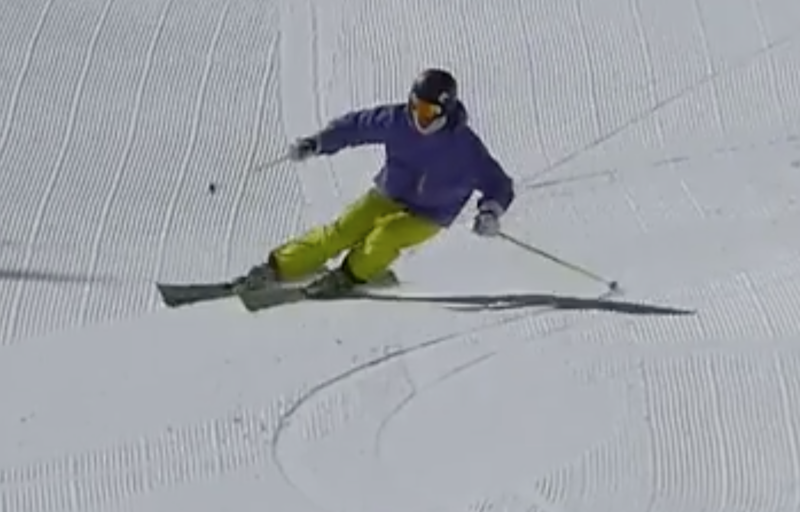 If you let it slide ahead instead, you can't tip it effectively anymore (reduced range of tipping) and the only thing left to do to put the ski on edge is to dump the hips into the turn. If you focus on pulling it back, then tipping it is natural and the two movements (pull back and tipping), combined, enhance greatly the turning of the outside ski. If you think practicing this feels like trying to ski telemark with alpine bindings you are on the right path... as you exaggerate it to learn it, it sure feels that way sometimes. Flexing is really the mechanism to lighten the inside ski. But, going even further, we can keep flexing it and pulling it to the chest to get maximum angles, since that will pull the body more into the turn. Keeping the inside leg flexed also allows the knee joint to work better as you tip the ski on edge. Hip dumping is usually allowed by pushing the inside ski forward early in the turn, which also twists the hips into an "early counter" and allows them to drop. By pulling the inside foot back and tipping it, hip dumping should be minimized or even impossible. Braquage is the best, in my mind. Focus on keeping the uphill ski both close to and parallel to the downhill ski and the toe bindings matched or the ski tips even. Do this a lot. Progress to falling leafs and then 360s on a steep pitch, where you again focus on keeping the inside ski (continuously transitioning between the left and the right) close to the other one, parallel to it and even tips. This will give you a hint of the effort and movements required to manage the inside ski, for effective skiing. As far as tipping it goes, the phantom javelin is the best: do mini-javelins where you only overlap the ski tips as opposed to crossing them. Keep the tip of the inside ski down (on snow or over the other one) and the tail up, keep the boots close and tip the inside ski. See Tipping in balance for more details on these drills. My own focus in my skiing is to pull the inside ski back with the heel, i.e. make sure my heel is dug well into the back of the boot. This incidentally moves the shin at a forward angle and frees up the knee, not to mention that it plays a part in dorsiflexion. The other thought I have is to hinge the pinkie of the inside ski on the snow. This will make it light as a hinge doesn't really work under pressure and also keeps the inside knee moving into the turn and the weight forward (it's the pinkie, not the heel). Lastly, as the turn is established, while still tipping the foot, I pull the knee to the inside/up (i.e. shorten the leg) to increase the angles. So, if you are to focus on one of your legs, it should the be inside. I will add and refine this in time, the subject is quite vast and a complete analysis could be pretty big. Keeping the skis close enables this management of the inside ski/foot. It is much harder to pull it back and tip it if the skis are wide apart. There is not a lot of literature out there... See my Ted and the Inside Ski post for visuals. The focus on the inside ski was introduced to me by way of the Essentials of Skiing book (which is still the best way to spend 25$ on skiing) and then underlined and reinforced in many ways at my coaching and masters racing courses. See more ski drill ideas or coaching ideas. However, the approach of seasoned ski racers (of lifting the inside ski) should not be neglected either, especially on very steep sections of a course. I am convinced that drills involving entering the turn while lifting the inside ski are the base from which one can progress to acquiring the technique of using the inside ski. Viewed 14420 times ( | Print ) this page.